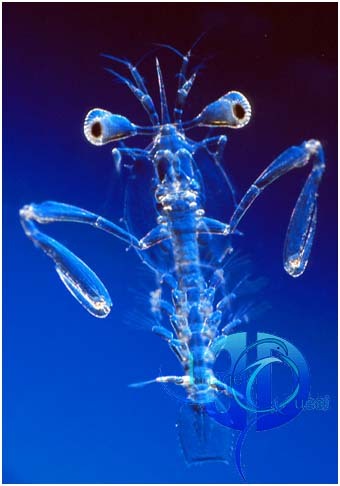 To see more stomatopod pictures click here. 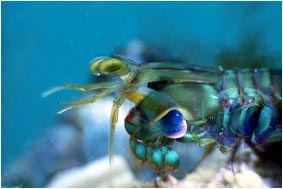 Aptly named Mantis Shrimps or Mantid Lobsters, or squillids, this group of predatious crustacea capture prey with large powerful raptorial limbs, just like the insect preying mantids do. 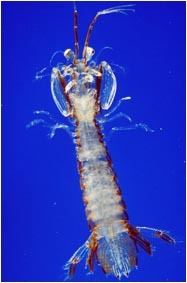 Adult shrimps may be 30cms long. Deep well formed holes lined with salivory mucus to keep walls intact. Some produce a flexible lid or sphincter, of sand and saliva which partly closes the tube. Mostly active at night these ferocious characters lunge from their tubes to grab over-swimming fish and almost any other suitable victim. 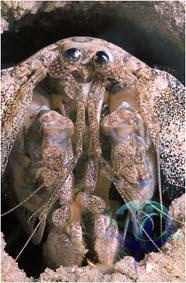 The eyes of stomatopods are the most sophisticated in the animal kingdom. Each eye and eye stalk has bifocal (3-D) vision. Each compound eye being dumbell shaped and capable of detecting three different polarisations of light. 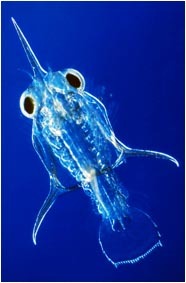 The late larval stages are beautifully transparent and are active predators in the plankton community. 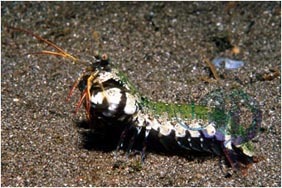 the group exhibits two types of larval development, the earlier stages of which are passed in the burrow. 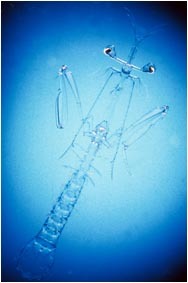 The later stages leading to the alima stage become more like the adult and prior to settling out, after six weeks or so in the plankton, they may be five centimetres long and as transparent as glass. 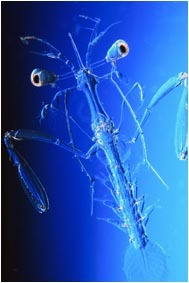 In Bermuda, Mantid shrimps are called 'split-thumb' or 'split-toe' because of their ferocious habit of striking at human interlopers!